You can see in this picture the Brushes2Less module. Connected to the left side of it is the output from the 4 in 1 controller. This is normally connected to the brushed main motor that came with your Blade CP. 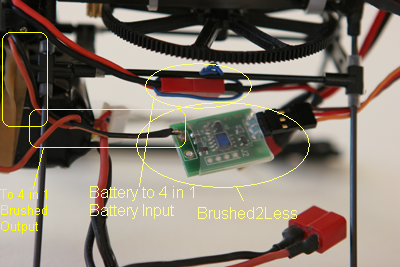 Connected to the right side of the board is the servo input to your brushless ESC. Just above the B2L module you can see the battery connection from my Y adapter. I basically took the stock connector from the 9.6 v battery and connected it to the battery input of my ESC. I left the Deans LiPo connector on the ESC so adding the 9.6 v battery connector created the Y. In this picture you can see the E-Flite Park 400. Make sure the KV rating is not too high. I found that 5400 was way to high, but the 3700 KV was perfect. 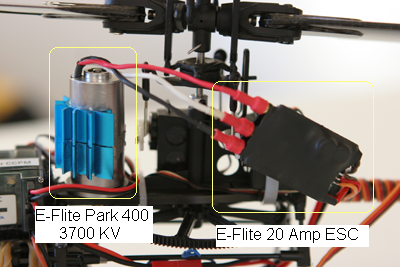 E-Flite also makes a Park 370 that is 3600 KV. This motor should work equally as well and give you even longer flight times. On the right you can see my E-Flite 20 amp Brushless ESC. I wrapped the servo wire around the tail shaft to keep it in place. What you don't see is that the ESC rests up against the zip tie that holds my servos in place. The tension from the brushless motor wires and the servo wire wrapped around the tail keep it snug against the zip tie, but out of the way of the servo arm for the swash plate. 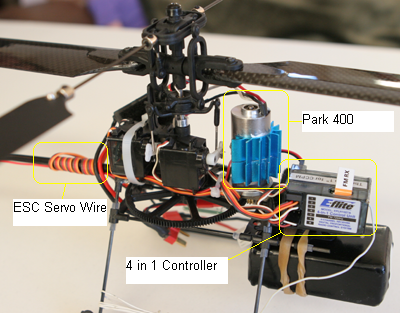 In this picture you can see the servo wire wrapped around the tail, the park 400 and the stock 4 in 1. I also use a 2200 LiPo. It is a little heavy, but the motor has no trouble getting it off the ground and flight times are 20 minutes or more.